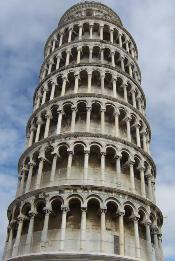 If you are planning a visit to Pisa, or somewhere near by you probably want some Information on leaning Tower of Pisa. Work on the Leaning Tower of Pisa began in 1173 AD and there has been an architectural problem almost from its beginning. As a reslt of the soft ground and a shallow foundation, the tower began to lean as early as the time the third floor was completed. This despite the over 13 foot-thick walls at the base. But engineers at the time had few resources to call on. There was no ground penetrating radar, geological science, lasers or huge cranes to right the work. If you read any information on Leaning Tower of Pisa you'll discover that ironically, the tower is not, or more accurately was not, the main attraction of the site. It was actuually intended as a bell tower for the nearby cathedral. Both are extraordinary works of Romanesque-Gothic art and it's only because of this unfortunate engineering failure that the Leaning Tower of Pisa is the most famous of these two structures. But far from being considered a failure at the time, it was not completely unknown for buildings to be less than perfect 800 years ago. There are examples in Germany, Ireland and even not far away inside Tuscany of both towers and rectangular buildings that lean slightly. Still, visitors today will be thrilled by the view from below or above. From the base, standing far back from the tower, one can see the round, layer-cake type facade. The base is somewhat plain, but not far up there are magnificent columns. The elaborate carving is even more amazing when one considers that the major construction effort was completed less than 200 years after beginning. The project was stalled for about 100 years while the Pisans engaged in battles with Genoa and other Italian city-states of the period. Then, picking up in 1275 AD it stalled again in 1284 AD, just before the belfry was added. Finally, in 1360, the building topped out at 51m/167ft. From the perspective of distance those who observe carefully can see that not only is the tower leaning (which is obvious), but that it is curved as well. Noting the lean, builders attempted to compensate by making some of the floors taller on the side opposite. The result gives the tower its slight banana shape. Fortunately, since digging out 70 tons of earth from below the ground, the tower was reopened in 2001. Visitors in bunches of 30 can now go up inside for a 35-minute guided tour. One of the most important bits of information on the Leaning Tower of Pisa is to be sure and get tickets well in advance. It's a hugely popular attraction and often can be fully booked for most of the day. If you are there for more than one day you may want to consider buying tickets 24 hours in advance.